From left to right: Dale McCabe Rapid City Police Sargent, Erik Bringswhite Meth Intervention Coordinator for the Oglala Sioux Tribe, Vaughn Vargas, Community Advisory Coordinator with the Rapid City Police Department, Norman Standing Soldier with Oglala Lakota Housing. Erik Bringswhite is a former Rapid City gang member who now works to stop meth use in South Dakota. Bringswhite uses Lakota culture and spirituality to reach out to those who are struggling with addiction. Bringswhite is a meth prevention coordinator with the Oglala Sioux Tribe. He stopped by the Rapid City studio for an interview with a group of individuals working to curb the use of the addictive drug in the state. 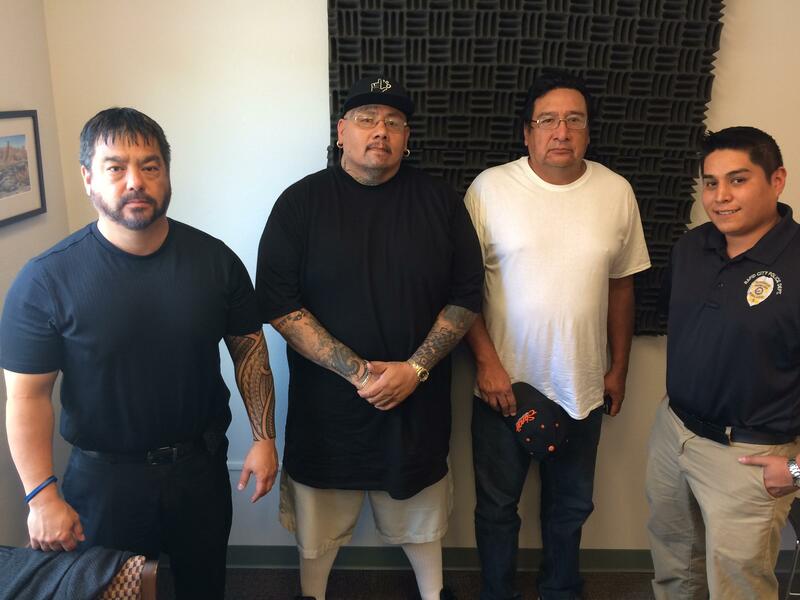 Bringswhite was joined in studio by Sergeant Dale McCabe, Rapid City Police Department, Norman Standing Soldier, Oglala Lakota Housing, and Vaughn Vargas, Community Advisory Coordinator with the Rapid City Police Department. Rapid City police officials and others dealing with meth use in the state are critical of recent reforms in South Dakota aimed at reducing the number of people in prison. They say the reforms have lead to a spike in meth in the state and increased crime is a result. You can hear excerpts from Bringswhite that aired on Dakota Midday below.